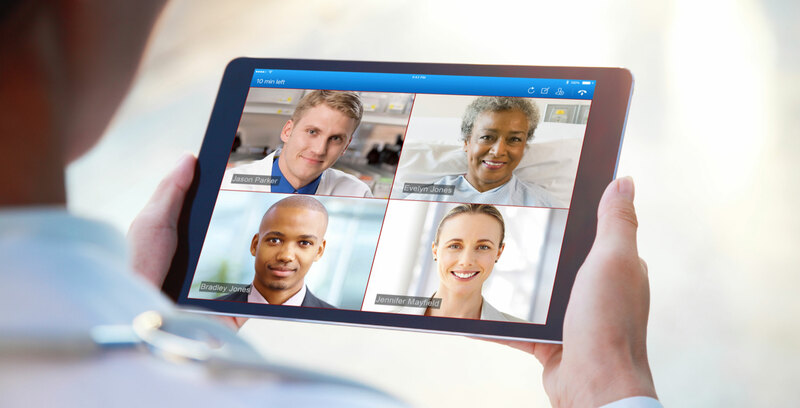 Health systems and health plans have their own unique strengths; by lifting the virtual barriers of telehealth care delivery, they can leverage these strengths through thoughtful telehealth collaborations. In turn, this is transforming the way care is delivered and received for the benefit of both patients, providers, and health systems. This post originally appeared on September 5, 2018, as the first in a series of sponsored guest blog posts on our Convergence conference blog. Today, Microsoft, via a blog post by its UK leader John Coulthard, announced the launch of HealthVault in the United Kingdom. Yesterday, Chilmark received a briefing from Microsoft’s Director of International Development, Mark Johnston who provided us the back-story on this launch and how this launch is different from Microsoft’s previous international forays in Canada and Germany. HealthVault UK is initially a very limited subset of capabilities focusing more on the MSN Wellness Center (or is it Centre for UK). Two reasons for this: First, as the National Health Service (NHS) is Microsoft’s largest enterprise customer worldwide (yes, larger than say the US federal government) and Microsoft certainly does not wish to directly compete against NHS’s own citizen-facing personal health platform, Healthspace. Secondly, Microsoft has been working closely with Nuffield Health, a private health & wellness organization in the UK who will be its first customer. Nuffield, which has ~150 facilities across the UK, both fitness centers, clinics and private hospitals, advocates a whole health model and is looking to the HealthVault platform, its wellness features and ability to take in biometric data as core to its strategy of providing customers a value-added service. Unlike Canada and Germany, where partners Telus and Siemens respectively will take HealthVault to market, in the UK Microsoft is going direct and will offer the HealthVault platform to prospects (healthcare facilities, fitness centers, long term care, etc.) on a common subscriber access license (SAL) model. With an SAL, Microsoft provides the base HealthVault “utility service,” and based on the client’s needs will build the ecosystem of apps on top of HealthVault, from third party ISVs as well as ones from Microsoft (e.g. MSN wellness widgets). Subscription costs scale, decreasing with a corresponding increase in number of subscribers. A client, such as Nuffield, then offers HealthVault to their customers. WebMD use a similar model for selling their platform to payers such as WellPoint or employers such as EMC or IBM here in the US. As with instances of HealthVault in Canada and Germany, the UK HealthVault service will be fully hosted within the country and be in compliance with all local laws for privacy and security. Microsoft has teamed up with the UK Cloud IT services provider, Attenda to provide hosting services. Since Microsoft is already going direct in its sales strategy for Amalga and Sentillion in the UK, longer term, one can envision them also deploying a strategy similar to that at New York Presbyterian combining Amalga, HealthVault and the bridging solution SharePoint, which they have now offer as HealthVault Community Connect. Clearly, there are those in industry that see the need for deeper consumer/citizen engagement in managing their health and are willing to take a a risk. Microsoft, Telus and Siemens are all huge companies with massive resources at their disposal to use patient money to build out these personal health platforms (PHP). But what we have not seen is a corresponding response from the market (consumers) that they are ready and willing nor, as in the case of the Telus release and this one in the UK, have we seen a ground swell of third party ISVs clamoring to get on-board and develop novel applications to serve the citizens of these countries. To some extent it is a “chicken n’egg” scenario wherein ISVs may be reluctant to build to the HealthVault platform until they see some tangible traffic, which at least here in the US has seen a rise upward, but still sits at a paltry 7%. Not exactly a vibrant market. Chilmark dinged the Telus health space roll-out for its lack of an ecosystem. Likewise, we have to ding Microsoft for its own efforts in the UK where honestly, this launch is extremely modest in scope, having no third party apps, just those simple widgets that were developed for the MSN Health & Wellness site. Not exactly pushing the envelop. But to their credit, Microsoft is putting their money where their mouth is investing for the long-term. If that investment pays off (i.e., consumers get on-board), Microsoft will have a substantial lead in the global market that will be near impossible for others to replicate. Today, New York Presbyterian (NYP) will announce a significant move forward in care coordination. Working with Microsoft for over a year, these two have co-developed an impressive platform called MyNYP.org. 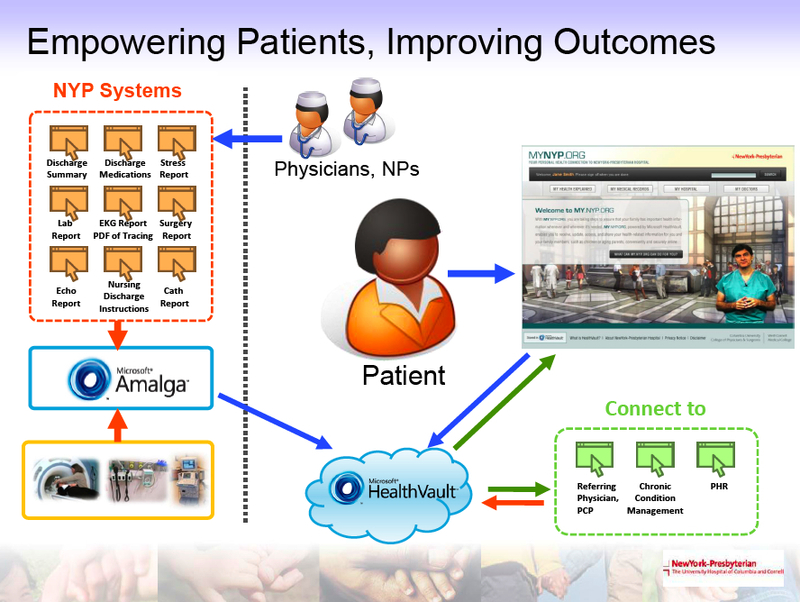 MyNYP.org is a consumer facing PHR solution for NYP customers that combines attributes of Microsoft’s two leading healthcare solutions, consumer-facing HealthVault and provider-facing Amalga. In addition to using Microsoft’s Unified Intelligence System (UIS) Amalga, to aggregate and present patient data to physicians, it is also using Amalga to aggregate and push such information into a customer’s/patient’s MyNYP.org PHR account. In doing so, NYP is providing the consumer the ability to access and export all of their NYP clinical records into their personally controlled HV account (see figure below). This provides the consumer with the gold standard of health data, clinical, with the portability and data management capabilities of HV. While NYP serves some 20% of population in New York City. The roll-out of MyNYP.org will occur in stages with the platform first being made available to cardiology and cardiac surgery patients. A customer of NYP is scheduled to have a procedure performed at an NYP facility. The customer goes to their MyNYP.org account, which may have been previously established for them and enters pertinent data into their account to share with the NYP care team prior to the procedure (note, this could even include advanced directives that they have put in the HV account). The information provided by the customer is used by the care team within NYP for advance planning to insure that the procedure goes smoothly. Upon discharge from the facility, the customer is provided all the usually printed information including discharge summary, instructions, meds, etc. This information is also available to the customer for them to export to their MyNYP.org account along with labs, clinical notes, EKGs, and other pertinent visit summary information which the customer can later share with their PCP. This scenario, “closes the loop” between, consumer, NYP and the ambulatory practice contributing to care continuity. All record transfers from NYP to a customer’s MyNYP.org/HV account are initiated by the consumer, supporting consumer consent & control. Therefore, the MyNYP.org will address both the inbound informational needs of the facility prior to a visit as well as outbound needs of the consumer and their care team residing outside of NYP. New York Presbyterian made it a point to stress that a key objective is to get visit summary information back into the hands of referring physicians, a growing issue for all hospitals. MYNYP.ORG supports full portability and control of personal health records by the customer/consumer. Many hospitals and IDNs currently offer a tethered-PHR with an oft-cited example being the excellent work done by Kaiser-Permanente with their MyChart, which now has customer adoption approaching 50%, an absolutely huge percentage. Thing is, virtually all such tethered-PHRs are simply a consumer portal into the EMR to view their records. The consumer has no real control of the PHR regarding access or portability – it is “locked” to the hospital. Such silo’d PHR models do not support care continuity nor consumer control. If you go to a competing hospital or a physician not associated with the hospital/IDN, it will be extremely difficult to share your records with them, unless of course one were to just share their password – not a great idea. Combination of Amalga and HealthVault addresses vexing problem of aggregating data from disparate apps. Most hospitals and IDNs have a huge collection of legacy software scattered across their facilities which can make it exceedingly difficult to aggregate and present a complete record of a customer’s history. Yes, there are Master Patient Index (MPI) solutions and various interface engines and the like that try to bridge across and link all of this data to provide a complete record, but tying that to the patient-facing EMR portal/PHR is challenging to say the least. Part of the success of KP’s PHR is that they are running their operations on a single EMR, EPIC and subsequently using the EPIC PHR, MyChart. Most hospitals and IDNs resemble NYP, which has instances of Eclipsys, Misys, Cerner, GE Centricity and a host of other clinical apps. Bringing together the capabilities of Amalga, as the aggregator with HealthVault as the PHR is an extremely attractive and compelling solution for virtually any medium to large-size hospital or IDN with a complex IT environment. Relinquishing control to consumer supports care continuity in the community. Consumers go to those facilities that provide the best and most convenient care. Sometimes that may be the PCP, other times a retail clinic, if necessary a specialist, and occasionally a hospital. The healthcare market is rapidly evolving to provide consumers with even greater choices, the problem is, with an increasing number of venues, there is no central entity responsible for aggregating all of health data, which is critical for care continuity. The only one best suited to aggregate and manage the multiple records that result from all of these interactions is the consumer (although vast majority of consumers do not know that yet – but that is fodder for a future post). Clearly, NYP sees this and is taking the necessary steps to assist their customers with better managing their health records in support of care continuity regardless of who ultimately provides that care. Amalga is installed within the firewall of NYP and thus this solution’s deployment at NYP clearly falls within the definition of “Business Associate” and is a covered entity in new HIPAA guidelines of ARRA legislative language. HealthVault and its use as the technology foundation for MyNYP.org, however, (as the figure above shows) sits outside the firewall of NYP. This combined with the fact that a MyNYP.org acccount is completely controlled by the consumer, leads to an interpretation that Microsoft HealthVault does not fall under HIPAA compliance. Like many before them, Microsoft sees clearly one of the key findings of our 2008 iPHR Market Report; the direct Business to Consumer (B2C) model for PHRs is extremely difficult to make work (if not impossible) today. Thus, they are now actively pursuing a Business to Business (B2B) model and are adding additional PHR functionality to the core HealthVault platform. Microsoft may also begin looking at other markets. Naturally, other PHR markets seem logical to attack, particularly the employer market thus coming into direct competition with WebMD. The RHIO/HIE market, however, is another market where the combination of Amalga and HV may create a compelling platform. But Microsoft’s offering is far from complete. A glaring hole is transactional processes. One of the challenges that Microsoft faces is how to fold in those critical transactional processes, such as eVisits, online appointment scheduling, prescription refills, etc. into their solution. Last year, Microsoft did announce a partnership with RelayHealth who certainly has the knowledge and capabilities to enable such functionality, but to date we have seen nothing materialize from that partnership. Direct from NYP, ala the Microsoft PR folks, is the following video that interviews various NYP senior staff and executives as to why they put together MyNYP.org. A little long, but well-worth the time. This is the future direction of health – “the orchestration of care” which includes active participation of the consumer. Congratulations NYP on this ground-breaking effort.